It goes without saying that pitching your startup to investors is very hard. Even those founders who have great charisma and salesmanship encounter unexpected problems during pitches. However, there are some problems you can predict and prepare for in advance. 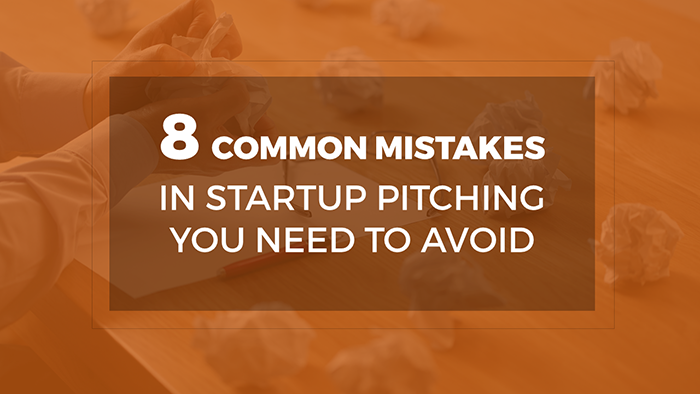 Make enough of these sloppy mistakes in a pitch, and you can blow your chance of landing a deal. This is something that applies not only to startup pitches, but to all public speaking audiences. Learn about your audience’s background, their likes, tastes and preferences. For investors, study their portfolios and understand their pattern and preferences. What type of sectors do they normally invest in? If you are pitching a fin tech startup and your investor has a knack for media startups, your words might as well fall on deaf ears. A startup pitch is just the introduction to your business idea. In dating terms, it’s just the first date—don’t try to land the marriage in one go. Make your slides short and simple. Even if you have, say, fifteen minutes of allotted time, try to prepare as if you have ten. This will not only make your presentation crisper but prepare you for any complications that may arise during the pitch. If your audience is hooked, you can always give them the details later. Not talking about your team and its credentials projects that you are not confident about your capabilities. If you are just starting out as an entrepreneur and have little to no prior work experience, it’s okay to be nervous. However, if you cannot show that your team is passionate and determined about making your startup a success, why should the audience get behind your idea? Another mistake you might make is just letting the one person talk while other members of team stand idly by. Letting everyone take the stage and cover different aspects of the pitch gives the audience an opportunity to get a better glimpse of your team, and thus get more invested in your pitch. The more technical you get with your pitch, the more likely are you to lose large chunks of the audience before the presentation ends. When it comes to your product, don’t just tell the features (what it does) but rather the benefits (how does it help?). When you say that you have no competition, you come off as amateurish and naïve. Every business has competition, whether direct or indirect. If you are unable to identify this, it conveys to the audience that you lack in-depth knowledge about the market. Even if your startup is at just the idea stage, you need to have a basic user acquisition and growth model, as well as monetization in mind. If you don’t have the core elements of your launch strategy laid out, you will fail to acquire much traction even if it’s the best product in the world. Telling a good startup story is a vital skill for every entrepreneur. It’s a key factor that will help you to score not only investors, but your very first customers as well. Telling why the problem you are trying to solve is important to you, and is important enough to need a business to solve it, is a good way to capture the audience’s attention. A great way to do this is to do a small user case study—it allows the investors to visualize how customers actually benefit from your product. One of the startup founders I got to work with always spends the first five minutes of his first conversation with any interested party telling his startup’s story. He tells it the same way, without fail, every time, and every time the other person was hooked by the time he finished. The key to getting this kind of reaction from your audience is practice, and there is no substitute to practice. Practice in front of your mirror, your co-workers and your friends, until you know every aspect of the pitch and slide deck by heart. Practice two, five and ten minute versions of your pitch so that you can modify it on the fly when needed. Anticipate what kind of questions you might get from investors, and then think about what the answers can be. Remember, you need to comfortable with your pitch, not memorize it—you need to come across as charming and confident, not rigid and monotonous. MS Rayed is the co-founder of SlideBee.